Accessories for Precision Lathe PD 250/E. Is mounted on the cross slide in place of the tool holder. For producing convex and concave shapes, for turning radii or 3/4 spheres up to max. 32mm. Height adjustable tool holder (boring tool tip adjustable from 30 through 45mm above cross slide) for use with FD 150/E, PD 250/E, PD 400 and older PROXXON lathes. Dimensions: base plate 67 x 50mm, height 55mm. Complete with finishing cutter 8 x 8 x 80mm. In wooden box with sliding lid. Quick change tool post - easy to use ! For quick tool change and easy height adjustment. Includes 2 tool holder elements. Can be used with the above above-mentioned quick change tool post. Made from 1.5mm (1/16") thick sheet metal, powder coated. Bevelled edges at the front and back allow slight cleaning. Mounting hole and raised base to secure lathe are pre-drilled. The depicted lathe is not included in the offer. For clamping angular and asymmetrically shaped work pieces. Capacity up to 80mm (3,1"). Chuck Ø 75mm (3"). Collet set with ER 20 collets: For extreme true concentric accuracy. 2 - 10mm (5/64" - 25/64"). For high precision machining of round parts. The collet set is mounted instead of the lathe chuck. With 8 collets (2 - 2.5 - 3 - 4 - 5 - 6 - 8 and 10mm). Packed in a wooden box. Centre turning attachment. For highest accuracy with high rotational precision. This includes: 1 face plate, 2 fixed centres (MT 2 and MT 1/short) and 1 drive dog. Packed in a wooden box. Especially for boring. Also required if the tailstock cannot be used to "counter". Up to Ø 40mm. 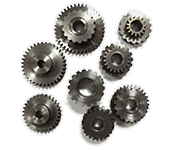 Contains 8 change gears for making threads with 56, 48, 42, 36, 35, 30, 28, 24, 21, or 18 thread pitch per inch. The number of teeth is imprinted on all gears. For the tailstock of the PD 250/E. Capacity up to 10mm (3/8"). Identical to chuck of lathe PD 250/E. High quality clamping fixture as per DIN 8386, Class 1 (concentricity accuracy 0.04mm). Capacity through reversing jaws from 2 - 75mm. 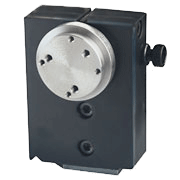 Suitable for PD 250/E and the dividing attachment NO 24 044. For accurate machining of circular work pieces (e.g. production of gear wheels). Supplied with two dividing discs (40 and 48 teeth), enabling standard divisions of 2 - 3 - 4 - 5 - 6 - 8 - 10 - 12 - 16 - 20 - 24 - 40 and 48. The taper of the dividing attachment is the same size as that of the main spindle of the PD 250/E lathe, thus 3 jaw chuck (to be ordered separately under NO 24 034) and 4 jaw chuck (NO 24 036) may be mounted. Horizontal fitting (e.g. on the cross-slide of the lathe) and vertical fitting (on the machine bed) are possible. With matching nuts and screws for fixation in MICROMOT standard T-slots 12 x 6 x 5mm (15/62" x 15/64" x 3/16"). Supplied in a wooden box with sliding lid. (5/16" x 5/16" x 3 9/64"). One each roughing out, parting, finishing cut, left and right cutter. Made from high-quality Cobalt HSS, pre-ground. Packaged in a wooden box. (15/64" x 5/16" x 3 9/64"). One cutter for external thread (ground to 60°, metric) , one for internal thread , one general cutting . Made from high-quality Cobalt HSS, pre-ground. Packaged in a wooden box. Three holders (5/16" x 5/16" x 3 35/64"), for roughing out , finishing cuts and boring bar , holes from 15/32". Standard tungsten tips, 55°, plated. Three additional inserts, securing screws and key TX8 are included. for the holders 24 555. Ten piece set. One each cutter for 60 degree (metric) and 55 degree (Whitworth) inside threads, 1.3mm (3/64"), 2.65mm (7/64") and 4mm (5/32"). Shank: 6mm (15/64"). Length: 95 mm (3 3/4"). The cutters are held by a tool holder that mounts to the tool post of the PD 250/E. Comes in a wooden box. Tool Holder for rotary tools. For use on lathe machines. 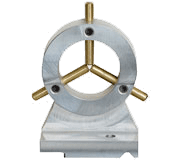 This holder allows mounting of our rotary tool IBS/E (collar size 20mm (4/5")) to the tool post of the Lathe PD 250/E for grinding or polishing purposes. Sizes: M 3 - 4 - 5 - 6 - 8 - 10. The straight shank 13/32" fits our drill chuck NO 24 020 when mounted in the tailstock of the PD 250/E. The holder is held by hand while cutting the threads. Comes in a wooden box. The heart of our MICROMOT precision tools for 115V is a comparatively more expensive direct current (DC) special motor. In relation to its size, the permanent magnet technology makes it very powerful, quiet and long-lasting. 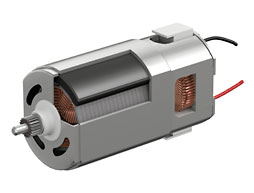 Due to its very high efficiency, this motor requires considerably less power for the same power output from the socket outlet than other commonly used motors. Of course, when utilizing these motors our first concern is to produce small, slender tools with high performance. The outstanding ratio of current consumption:power output also contributes significantly to energy saving, thereby also protecting our environment!